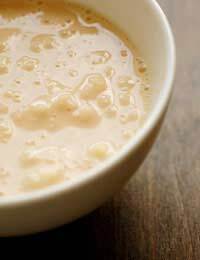 Rice pudding is a wonderfully simple dish to make and you can add all sorts of exciting ingredients to it. For a variation on the traditional rice pudding, try making a semolina and adding fruit, nuts or spices to give it some depth. Some of these puddings are almost a meal in themselves. They are also quick to prepare and can then be left cooking in the over while you get on with something else. To make a richer version of each dish, add some cream along with the milk. Sweet toppings can also be made by drizzling a little honey or sugar free jam on the top before baking the dish. This is a good solid pudding that has real body to it. To give it a little more edge why not add a spoonful or sugar free jam or honey as you are serving it in the bowl? Preheat your oven to 150 deg C/300 deg F/gas mark two. Take a large dish and butter the inside. Take the rest of your butter and melt over a low heat with your jam. Then tip this into your pudding dish, along with your milk and rice. Stir until the rice is covered. Place in the centre of the over and cook for about an hour, or until the rice is light and puffy. For a richer version, stir in a little cream. This is a slightly more exotic version of straight forward semolina. It has extra colour - and a little more “zing” than usual. Preheat your oven to 150 deg C/300 deg F/gas mark two. Stir your saffron into your milk and warm it gently in a small pan over a low heat. Add your spices (except the nutmeg) and your rice. Butter a large pudding dish. Put your semolina in. Cover with your warm liquid and stir. Sprinkle with nutmeg. A slightly unusual take on normal rice pudding, this version has a rice coconut flavour. Coconut milk enhances the creaminess of the dish as well as adding the unique taste. Preheat your oven to 150 deg C/300 deg F/gas mark two. Take a large dish and butter the inside. Take your honey and butter, and melt over a low heat. Slowly add your coconut milk and keep stirring until well mixed. Remove from the heat. Pour your rice into your pudding dish. Cover with the warm liquid. Sprinkle with nutmeg. Place in the centre of the over and cook for about an hour, or until the rice is light and puffy.